The Mengku tea growing area is located in Yunnan’s Lincang Prefecture Shuangjiang County town of Mengku. 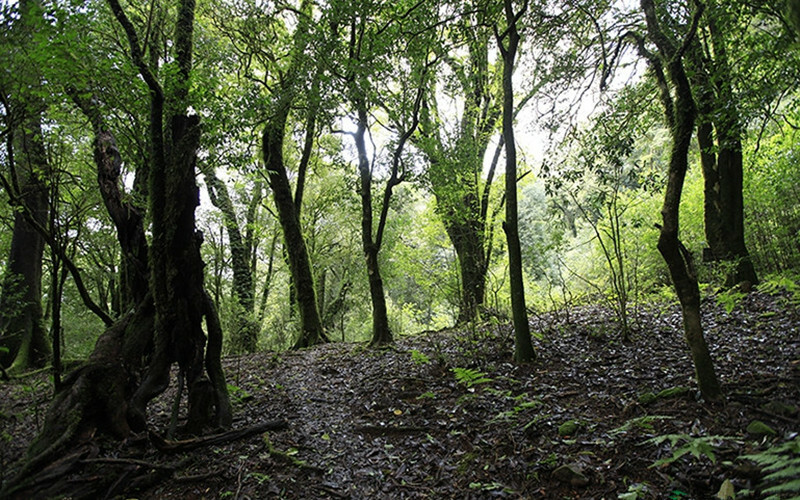 Mengku contains the largest distribution of wild tea trees in Lincang. It is the highest elevation and densest currently known group of Dali variety tea trees growing on earth. 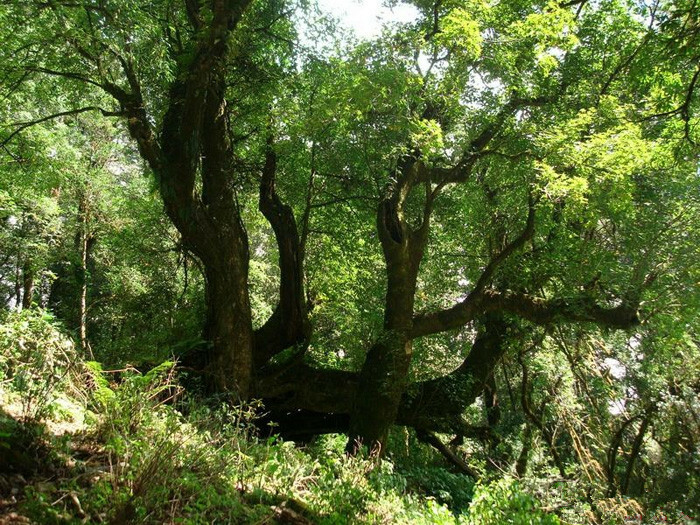 These trees grow on the middle and upper reaches of the Shuangjiang County Daxue Mountain and are scattered over more than 12,000mu. The elevation is between 2,200 and 2,750 meters. Mengku ancient tea trees are considered wild-type wild tea. In evolutionary terms, they are more primitive than Pu’er tea varieties. These trees possess all characteristics and components of tea trees (tea polyphenols, amino acids, caffeine, etc). They can be used to produce and drink tea. They are genetically primitive and grow in a cold, high altitude region. This tea variety is highly stress and cold resistant. It is a valuable resource for researchers of molecular biology and resistant plant breeds. It is the green pearl of Shuangjiang. Why is Ancient Tea Plantation so special? The wild tea tree is more primitive than the Pu’er tea species. It has all the morphological characteristics of tea trees and functional components of tea trees. The wild tea tree community in Yunnan is one of the origin centers of the world tea tree. The wild ancient tea tree community in Mengku Snow Mountain is unanimously recognized by experts as the world’s first wild tea plant community with the highest altitude, the widest distribution area and the largest population density. Mengku was already well-known as a region that produced exceptionally good tea in late imperial China. In 1761, for example, gifts sent by a tribal chieftain in Shuangjiang to cement a marriage alliance in Shunning – present day Fengqing (凤庆) – included sacks of Mengku tea seedlings. In 1896, a tea trader purchased a large quantity of tea seedlings from Mengku which were packed on caravans and eventually planted by tea farmers in Yunxian (云县), three hundred kilometers northwest of Mengku. If we comb the textual sources even earlier we find that in 1485, Dai tribal chieftains from Bingdao (冰岛) – a famous tea estate located north of Mengku — sent tea seedlings to Xishuangbanna in the province’s deep south. Today, apart from tea, Mengku produces sugarcane and some of the best rice noodles in the province. A raw green pu’er tea called gongnong tea (公弄茶) named after the village where it is grown. The tea has a freshness and potency that assaults the mouth on first impact, but by the fifth and sixth infusions its sweetness remains in the mouth and throat. The bitter first taste is followed by a sweet aftertaste called huigan (回甘) or liugan (留甘) in standard Chinese, a ‘returning, lingering sweetness’ that remains in the throat for quite some time. A popular Tibetan saying goes like this: “I’d rather starve for three days than live without tea for one.” By the end of the trip you would become utterly addicted to these bittersweet teas. The mountaintops hovered above wisps of clouds and seemed inaccessible to mere terrestrials at an elevation of around 1,700 meters above sea level. There is always something numinous about being among the clouds – watching them move ever so gently, ever so slowly. And as for the tea gods or spirits, they had long set up their home among these ancient tea trees and mountain ranges. Fenghua Tea Factory, the tea factory produces pu’er and black teas. The black teas there were not as caffeinated as other premium black teas such as ‘China Red’ and ‘Golden Bud’ that I had sampled earlier in the year in Fengqing. There are four main ethnic groups in Lincang – the Lahu, Wa, Bulang and Dai – all with their own distinct ethnic markers. A large concentration of Lahu people live in Nanmei Village, and as you roamed around the street market you will notice a number of old Lahu women in ethnic dress walking through the market smoking long tobacco pipes. The Lahu people live around Lincang and Pu’er but many also inhabit Myanmar, Vietnam and Laos. A tea sellers in standard Chinese with the local dialect reel off bits of tea facts: “tea grown near walnut, eucalyptus and peach trees will produce bitter tea”…”tea grown near Osmanthus flowers or sagebrush will produce a sweet tea”…”tea grown at different elevations will produce different flavours of tea because of factors such as rainfall, cloud mass, and soil.” It now fetches ridiculously high prices in Yunnan and across China, a mania reminiscent of the Pu’er tea craze in China in 2005-2007. The process of making tea for others – an offering to share something special with friends or guests without trying to get anything or be anywhere else. The simple act of making a delicious bowl of tea as an offering and in such stunning surroundings will renew your sense of the preciousness of life. Unlike the pictures seem fixed and immutable, the stories heard, the stories shared, the stories retold on the trip, as well as the many infusions of teas sipped, slurped and drunk, seemed to change shape all the time. Among the ancient tea trees, the first tea tree is the most remarkable tree, enjoying the history of over 2700 years. It is 16.8 meters high, 3.25 meters wide. Standing under the tree, reverence is born in the mind. We can take a shuttle bus, fourteen hours and 750 kilometers on an overnight bus from Kunming to Mengku (勐库). To Mengku Snow Mountain, travelers can drive since there are no shuttles. From March to May, travelers can enjoy the charming landscape and get rid of the rainy season.